The skilled regional nominated (489) visa is a provisional skilled visa that allows you to live and work in regional New South Wales for up to four years. This visa provides a pathway to permanent residence. If you hold this visa and live for at least two years and work for at least one year in a specified region of NSW, you may be eligible to apply for a permanent visa at a later stage. NSW Department of Industry works in partnership with participating Regional Development Authorities (RDA) committees in NSW to deliver the 489 program. Under this arrangement, NSW RDAs that choose to participate in the 489 program can select and nominate candidates whose skills are needed in their region. Participating regions determine their own list of eligible occupations as well as any additional eligibility criteria. For detailed information on the eligibility criteria and application process, please check the website of the relevant region. Due to the large number of applications received, RDA Central West (RDACW) is not accepting more applications for nomination for the 489 visa. Please visit the RDACW website for up-to-date information. Agree to live and work in the region that nominated you. Submit an Expression of Interest (EOI) in SkillSelect. Ensure that you meet the 489 visa criteria. Apply to the relevant NSW RDA for nomination and wait for the outcome. Ensure that you meet the participating RDA's 489 nomination criteria. If you are nominated by NSW, apply for the visa to the Department of Home Affairs. If your visa is granted, move to your nominating region in NSW and commence your commitment to live and work in the region. 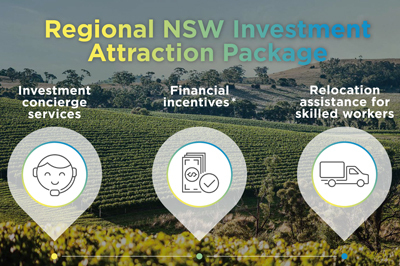 For more information on opportunities for living and working in regional NSW please visit Regional NSW.